On December 9, 2003, a Royal Proclamation was signed in Canada wherein Queen Elizabeth II acknowledged for the first time the wrongs committed in the name of the English Crown during the Acadian deportation of 1755. Additionally, the Proclamation sets July 28th of every year, beginning in 2005, as “a day of commemoration of the Great Upheaval.” The 10,000 men, women and children exiled from Nova Scotia some two and a half centuries ago are the ancestors of many of south Louisiana’s French-Acadian or Cajun people. The effort began in 1988 by Warren A. Perrin to seek an apology from Queen Elizabeth II for the illegal deportation of the Acadians from Nova Scotia, an acknowledgment that the expulsion was wrong under English law and a symbolic good-will gesture to the Acadian people. Commonly referred to as “The Petition,” the initiative was officially launched in January,1990 when a Petition on behalf of all Acadians was delivered to then-Prime Minster Margaret Thatcher of Great Britain and Queen Elizabeth II. As a result, attorneys and historians representing each side began negotiations to settle the historical dispute. The thirteen years of discussions and debates brought the world Acadian community together. The Petition caught the attention of the international legal community and, as a result, in 1993, Perrin was invited to present legal arguments in support of the Petition at the World Human Rights Conference in Caen, Normandy, France. On December 9, 2003, Queen Elizabeth II signed the Royal Proclamation acknowledging the wrongs committed against the Acadian people in the name of the Crown and establishing a “Day of Commemoration” on July 28th of each year. 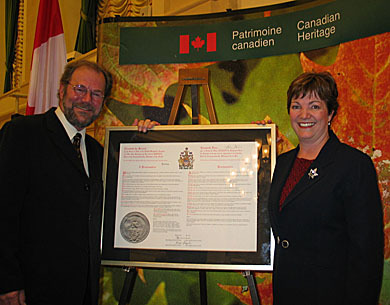 Shown at the signing in Ottawa, Canada are: Euclide Chaisson, President of Société Nationale de l’Acadie and Sheila Copps, Minister of Canadian Heritage. Order a reproduction of the Royal Proclamation in our online boutique.